Vocal abuse or misuse is often described as “vocal loading.” Vocal loading is a term used to describe stress put on the speech organs (mouth throat, vocal chords and lungs) when speaking for long periods. Teachers/lecturers, individuals involved in sales and entertainers are just a few of the types of people who use their voices consistently and as the primary tool of their trade. It is now known that dry air, dehydration, loud speech, smoking and air pollution all have adverse effects on the voice. 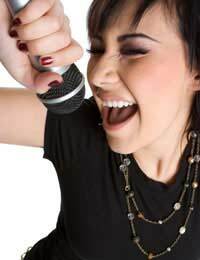 The vocal chords need to be lubricated by a layer of mucus in order to vibrate properly and produce speech, and dry air can have an adverse affect on this moisture. Air-conditioned buildings and airplanes in particular are known for dry air. To combat this stress, individuals can place a humidifier indoors, especially at night, to put moisture back into the air. Gargling with warm, salted water may help re-lubricate the vocal chords directly. On airplanes, drinking a glass of water per hour may also help. Much like dry air, dehydration presents a risk to the voice as it means that needed moisture in the vocal chords is unavailable. Directly lubricating the vocal chords by drinking 8 glasses of water per day, or one glass of water per hour on planes or in other extremely dry environments, will help re-hydrate the entire body. Avoid beverages with caffeine, however, as they can actually leech further moisture from the body. Alcoholic beverages, coffee, tea and fizzy drinks should all be avoided, though natural fruit juices and herbal teas are usually acceptable. Speaking loudly, yelling and screaming all put undue stress on the vocal chords. Not only does loud speech dry out the vocal chords quickly, but it can lead to the development of vocal nodules as well. These little bumps form on vocal chords due to stress, and because they appear in pairs – one on each side of the vocal chord – they often meet in the middle and do not allow vocal chords to close properly. This means that the voice will often take on an unintended husky tone. Refraining from loud speech and subsequent undue stress on the vocal chords can help keep vocal nodules from developing. Smoking affects the voice in many ways. To begin with, inhaling smoke (that includes toxins) dries out and damages the vocal chords. Smoking also affects an individual’s ability to breathe deeply into the lungs, limiting the power of the voice. Smoking is also the leading cause of laryngeal cancer, or cancer of the larynx (voice box). Smokers should quit immediately to avoid further damage to the voice, and non-smokers should be sure to avoid second hand smoke when possible. Breathing in polluted air means breathing in tiny particles of dust and chemical substances on a regular basis. Much like cigarette smoke, these particles can dry out and damage the vocal cords and make breathing deeply into the lungs difficult. To avoid breathing in polluted air, invest in air filters for the home. Many workplaces are also willing to make sure that all employees are breathing in purified air. Unfortunately, some air purifiers can make air dry, so humidifiers may need to be investigated as well. In addition to ensuring proper air purity and hydration, ensuring that the body does not become dehydrated and avoiding loud speech and smoking, there are even more ways of avoiding vocal abuse and promoting vocal health. Eating a healthy diet, getting enough rest, warming up the voice adequately each morning and after long periods of remaining quiet and sitting/standing up straight when speaking will allow help avoid stress on the voice. Contact a speech therapist or vocal coach for further information on how to care for and preserve the voice.